In 1976, Polyakov (1976) predicted the existence of ionospheric Alfvйn resonator (IAR), equivalent to the ionospheric waveguide, but operating in vertical direction with shear Alfvйn waves. According to the theory, further developed by Polyakov and Rapoport (1981), waves can be trapped between two altitudes characterized by large Alfvйn velocity gradients: the lower limit occurs at ionospheric F-layer, the upper limit at about 3000 km. For a recent review, see, e.g., Lysak (1993). The so-called spectral resonance structures (SRS) discovered by Belyaev et al. (1989, 1990) are considered to be an evidence for IAR. They are thought to form within the IAR from electromagnetic emissions of lightning charges, just like the Schumann resonances. Up to fifteen bands can be observed, from the 1-2 Hz (Pc1 range) to well above the second Schumann resonance frequency at 14 Hz. After the original finding of SRS at mid-latitudes, they have now been observed also at high-latitudes (Belyaev et al., 1998; see also the figure). 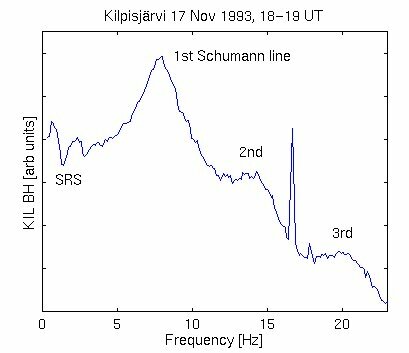 Note that it has been suggested that a special Pc1 pulsation type, the pearl pulsations, could be explained by IAR based Alfvйn maser (Belyaev et al., 1984). Belyaev, P. P., S. V. Polyakov, V. O. Rapoport, and V. Y. Trakhtengerts, The fine structure of the radiation of an Alfvйn maser, Geomagn. Aeron., 24, 202-205, 1984. Belyaev, P. P., S. V. Polyakov, V. O. Rapoport, and V. Y. Trakhtengerts, Experimental studies of the spectral resonance structure of the atmospheric electromagnetic noise background within the range of short-period geomagnetic pulsations, Radiophizika, 32, 663-672, 1989. Belyaev, P. P., S. V. Polyakov, V. O. Rapoport, and V. Y. Trakhtengerts, The ionospheric Alfvйn resonator, J. Atm. Terr. Phys., 52, 781-788, 1990. Belyaev, P. P., T. Bцsinger, S. V. Isaev, V. Y. Trakhtengerts, and J. Kangas, First evidence at high latitudes for Ionospheric Alfvйn resonator, J. Geophys. Res., in press, 1998. Lysak, R. L., Generalized model of the Ionospheric Alfvйn resonator, in Auroral Plasma Dynamics, Geophysical Monograph 80, edited by R. L. Lysak, pp. 121-128, American Geophysical Union, Washington, 1993. Polyakov, S. V., On properties of an ionospheric Alfvйn resonator, in Symposium KAPG on Solar-Terrestrial Physics, vol. III, pp. 72-73, Nauka, Moscow, 1976. Polyakov, S. V. and V. O. Rapoport, Ionospheric Alfvйn resonator, Geomagn. Aeron., 21, 610-614, 1981.